Focaccia: Focaccia is popular in Italy and is usually seasoned with olive oil and salt, and sometimes herbs, and may be topped with onion, cheese and meat, or flavored with a number of vegetables. Focaccia dough’s are similar in style and texture to pizza dough’s, consisting of high-gluten flour, oil, water, salt and yeast. Focaccia is typically rolled out or pressed by hand into a thick layer of dough and then baked in a stone-bottom or hearth oven. Bakers often puncture the bread with a knife to relieve bubbling on the surface of the bread. Combine the water, yeast, sugar and 2 tablespoons of oil in a small bowl. Set aside in a warm, draught-free place for 5 minutes or until frothy. Place flour and half of the sea salt in a bowl. Make a well in the center and pour in yeast mixture. Use a wooden spoon to stir until combined. Use your hands to bring the dough together in the bowl. Turn onto a lightly floured surface and knead for 10 minutes or until smooth and elastic. Brush a bowl with oil to grease. Cover with plastic wrap or a damp tea towel. Set aside in a warm, draught-free place for 45 minutes or until doubled in size. Brush a 20 x 30cm Swiss roll pan with 2 teaspoons of remaining oil. Punch down centre of the dough with your fist. Turn onto a lightly floured surface and knead for 2 minutes or until dough is elastic and has returned to original size. Press into the prepared pan. Cover with a damp tea towel and set aside in a warm, draught-free place to prove for 20 minutes or until doubled in height. Use your finger to press dimples into the dough. Brush with remaining oil and sprinkle over rosemary and remaining salt. Press the olives into the dough. Bake in oven for 25-30 minutes or until golden and focaccia sounds hollow when tapped on base. 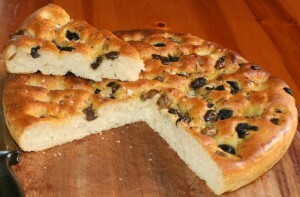 Focaccia is ready to be served.